TV talking heads tell us Bernie Sanders failed to become Democratic Party nominee for President of the USA. 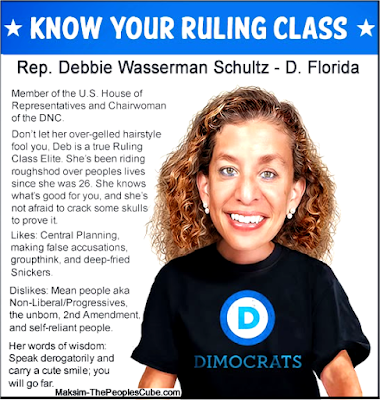 They slice their commentaries in various ways, but avoid a major point: Bernie came into the corporate-controlled Democratic Party and nearly deposed their already-crowned Queen -- and Bernie is not even a member of the Democratic Party. Corporatism stacked the deck against Sanders. "Superdelegates" favoring Clinton were quickly & overwhelmingly appointed, choices of their party bosses who funneled huge monies to Clinton. Party bosses restricted Sanders campaign access to the national Democratic voter database -- after sharing Sanders supporter data with others (with the NGP VAN database). In some states such as New York, only Party members registered many months previously were allowed to vote at all. As Clinton gradually looked poised to win the nomination, they pressured other candidates to drop out. The crushing Party mechanisms were operated by a creepy 49-year old politico from Florida, Debbie Wasserman Schultz, former co-Chair of Hillary Clinton's 2008 Presidential effort. The Party bureaucracy is now saturated with talking heads and parasitic political operatives, desperately seeking self-enrichment & wholly deaf to progressive change. Sanders did more than shake things up. Sanders helped us recognize the heavy CHAINS we're forced to wear. Student debt, a predatory financial system, an overseas-based military with procurement spending out of control (but poor veteran support services), an economy with insufficient environmental safeguards, an election system of candidates spouting foolish platitudes & lies. Sanders was always an INDEPENDENT. Sanders walked into the Democratic Party and won much support. Now buzzards circle, clucking "Same old, same old" -- But perhaps change may still happen... American independents, not so easily corralled by poor choices & decrepit party hacks, may still generate true change. The awareness built by Bernie Sanders will not easily fade.